“Going Rouge: Sarah Palin – An American Nightmare” to be Released November 17th!! All orders before November 17, 2009, get a 10% discount. "Going Rouge: Sarah Palin – An American Nightmare" is set to be released on November 17, the same day as Sarah Palin's memoir "Going Rogue: An American Life"
Available only from OR Books. With contributions by: Max Blumenthal, Joe Conason, Eve Ensler, Michelle Goldberg, Jane Hamsher, Christopher Hayes, Jim Hightower, Linda Hirshman, Naomi Klein, Dahlia Lithwick, Amanda Marcotte, Shannyn Moore, John Nichols, Katha Pollitt, Hanna Rosin, Matt Taibbi, Michael Tomasky, Rebecca Traister, Katrina vanden Heuvel, Jessica Valenti, Patricia Williams, JoAnn Wypijewski and Gary Younge. It’s Not Sarah’s Fault…Just Ask Her! Alaska Govenor Sarah Palin and "Joe the Plumber" aka Joe Wurzelbacher. In her op-ed in the Washington Post this week, Sarah Palin, while still governor, took up the sword for corporate interests; a position directly opposing what is best for Alaska. What or whom changed Sarah Palin’s mind about cap-and-trade? 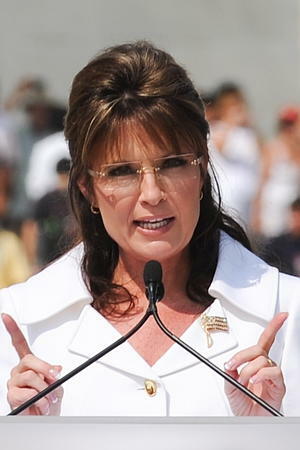 In both her resignation speech and her op-ed, Palin touted AGIA, the Alaska Gasline Inducement Act. It was widely supported and passed with a vote of 58-1. “This is the largest private sector energy project, ever. THIS is energy independence,” she said on July 3. In her piece, she railed Obama’s plan for cap-and-trade. She mentioned AGIA again and how we are “progressing” the 3,000-mile project. Shannyn Moore, Progressive Alaskan Blogger and Host of the The Shannyn Moore Show on Anchorage Radio Station KBYR 700 AM. It turns out that blogger Phil Munger hears all his big, breaking Sarah Palin news in the kitchen of his house, which overlooks Neklason Lake and sits just 10 miles from the center of Wasilla, the Southcentral Alaska town where Palin once served as mayor. On July 3, Munger, a music professor and former ’60s anti-war activist who started his blog Alaska Progressive in November 2007, was in his kitchen and got gobsmacked by the announcement that Palin was handing over the reins of the state to her No. 2, and doing it for the good of Alaskans. 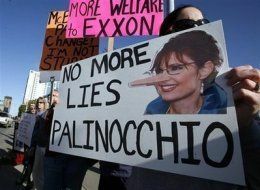 The Anchorage Daily News reported on a large Anti-Palin demonstration held in Anchorage, Alaska this past Saturday, 27, 2008. Alaskans have grown increasingly frustrated with Governor Sarah Palin’s lack of cooperation in the “Troopergate” ethics investigation. Extensive photographs of the protest have been set to music and posted on YouTube.com, one of which is included below. A protest rally blasting Gov. Sarah Palin’s handling of the state’s so-called troopergate investigation — and calling for the attorney general to resign — drew 1,000 or more people in Anchorage on Saturday. Protesters chanted “Recall Palin!” as organizers told the crowd to push state legislators to keep after their investigation into the governor’s firing of Public Safety Commissioner Walt Monegan. …The speakers were great. CC from KUDO radio, Shannyn Moore from Air America, Ron Devon reading a letter of support from Rep. Les Gara who was out of state, Libby Roderick, local folk singing legend, John Cyr, head of the troopers’ union, and many more. The greatest of all was the final speaker – Walt Monegan’s Mom. She stood up, obviously emotional, and thanked the crowd for their support. “I never knew so many people loved Walt,” she said, her voice quivering a little. She talked about her son, and that he was a good man. “I’m going to cry……I don’t know what else to say but, thank you!” She sat down again, and mopped her eyes, and the crowd went wild.